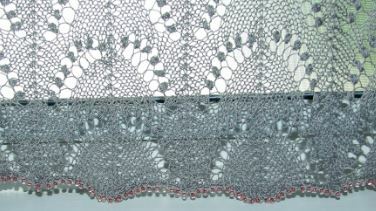 I recently finish a lace curtain set I made for my bathroom. I used Curio from Knitpicks for my yarn. 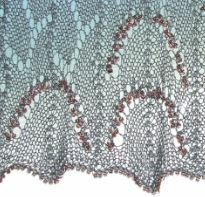 It is truly a luxury crochet weight (lace)with a softness and sheen that is very lovely. Below is a picture of the finished project. When I had finished the main panel, I decide to get”cute” and trim the bottom edge with rose colored beads to add a little contrast. When it came to the valance, I decided to try replacing the Nubbs/Bobbles with the rose colored beads. *I know that there are some who will want to quibble over the terms bobbles and Nubbs, but for me, any time a pattern calls for me to knit up more than 3sts in one knit, and gather it together in the purl row, I think of it as a bobble. Maybe that is because I think of a bobble as something that “hangs,” and a nubb, as something that just makes a bump. Anyway, it is the end results that counts. It has been fun working with this great yarn, and adding the beads was just an extra bonus. I have charted this pattern for you, along with instructions on how to replace the Nubbs/Bobbles with beads. I am sure you will come up with more ideas once you get started. Please take time to practice and swatch each section. The cast on will be determined by your window. I advise adding at least 4 inches in width for ease. 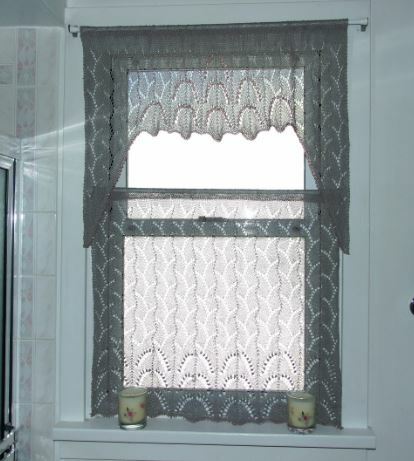 The lace curtain pattern includes instructions and charts for lower panel and valance. * Note- you do not have to print off the last page of the pdf pattern. As you will note, it has cross stitch info that is not for knitting-it’s just part of my charting program. By the way, my window opening was 24 by 36, which is the area I wanted to cover.